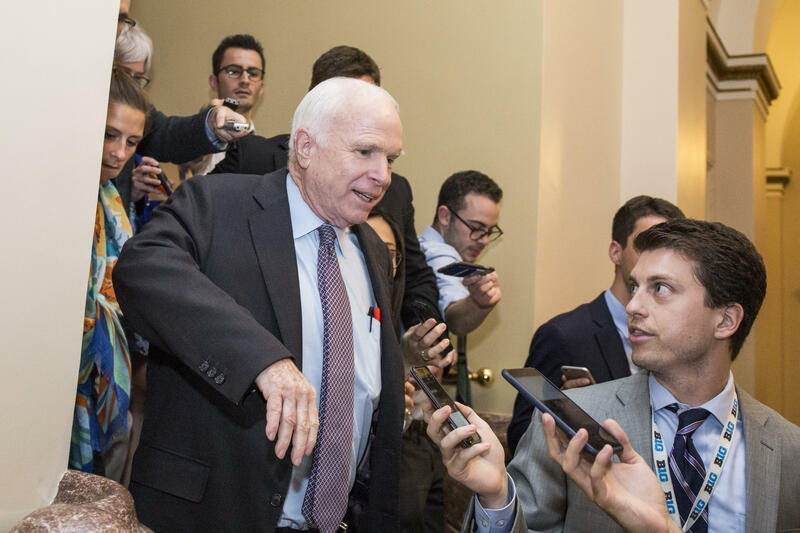 Sen. Ron Johnson on Wednesday suggested Sen. John McCain's brain tumor and the late hour influenced the Arizona senator's surprise vote against the GOP's proposed partial repeal of Obamacare last month. McCain was one of only three GOP senators to vote against his party's "skinny repeal" proposal, tanking the bill and quashing GOP hopes of tackling health care reform anytime soon. McCain, who had been diagnosed with an aggressive form of brain cancer shortly before the vote, flew from Arizona to Washington, D.C., to help with the health care battle before returning to Arizona for further treatment. It was unclear where McCain would side on the legislation in the long moments leading up to the vote. "We did get a call from Paul (Ryan) and he assured us that 'skinny repeal' was not going to pass the House -- it would have to go to conference," Johnson said on AM560 "Chicago's Morning Answer," addressing his understanding of the health care vote's process. "Again, I'm not gonna speak to John McCain. He has a brain tumor right now, that vote occurred at 1:30 in the morning, some of that might have factored in," McCain said. The radio host, taken aback by the comments, asked if Johnson "really" thought McCain's brain tumor possibly influenced his decision. "Again, I-I-I don't know exactly what -- we really thought -- and again I don't want speak for any senator," Johnson said. "I really thought he was going to vote yes to send that to conference at 10:30 at night. By about 1, 1:30 (a.m.), he voted no. So you have talk to John -- for what was on his mind." McCain has offered his own explanation for why he voted out of step with his party. "I thought it was the right thing to do," he told reporters after the vote. Johnson, the chairman of the Senate Homeland Security and Governmental Affairs Committee, was himself reluctant to move forward with the GOP's Obamacare repeal attempts, despite being a longtime critic of Obamacare. The conservative Johnson had feared the GOP proposals didn't go far enough to scale back Medicaid spending.